***FYI – All of my internal pictures have disappeared and I can’t find the original files – I’ll be making more Raspberry Fruit Leather in a few weeks and will update picture then – sorry! I love homemade fruit leather. It is so much better than anything you can purchase in the store, you control the sugar content and it is surprisingly inexpensive, simple and easy to make. This recipe will work with all berry based fruit. I’ve used blueberries, strawberries, and blackberries as well as apricots. Sugar-Free Applesauce to taste – I typically do 3 cups of applesauce for each package of raspberries. I’ve also used pear sauce and love the slightly different flavor. Sugar to taste if needed – If you chose ripe fruit you’ll never need to add sugar. Mix the raspberry’s and applesauce together in a blender. Personally, I use the Ninja and love it. The trick is to get the right level of sweetness. 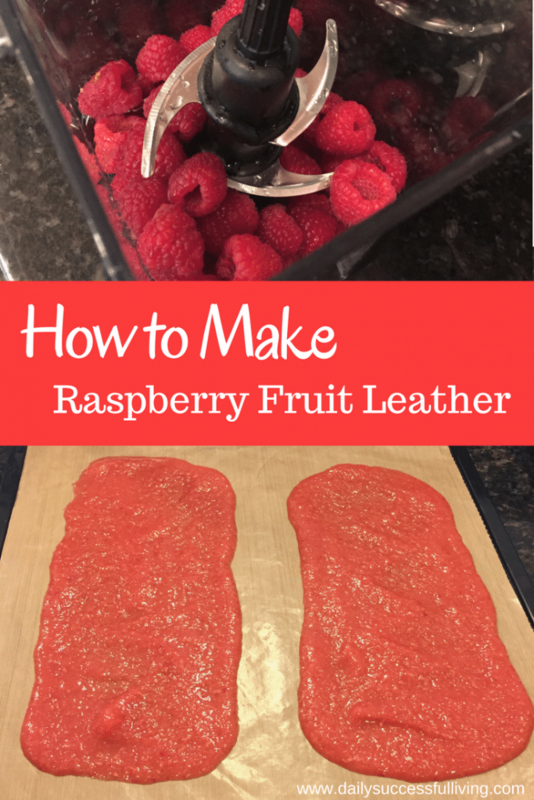 Remember that as the raspberry fruit leather dehydrates it will lose some of its sweetness, so don’t be concerned if you feel like it is overly sweet. I personally don’t like a super sweet fruit leather, so I never add extra sugar. If you are concerned about losing color (most fruit leather will fade with time) you can add a little bit of lemon juice or some pectin. My fruit leather gets eaten so quickly that this isn’t an issue for me. Blend the fruit until it is the consistency of a nice smoothie. As you can see from my picture below it should be smooth enough to pour easily, but not so runny that it spreads without your help. Pour 1/3 to 1/2 cup onto your dehydration sheets. I don’t measure, I just pour based on the size of my sheets. Once you have poured the raspberry fruit leather on your dehydration sheets take a large spoon and slowly even it out. The trick is to have a thin level surface that will cook evenly. With the ratio’s of used above, I can typically make five sheets of fruit leather which is 10 fruit rolls. I use the Excalibur 3900B dehydrator and live in Phoenix which has virtually no humidity. My fruit leather typically takes about 6 hours to cook, so I always start mine in the morning rather than chance having it run all night and get overcooked. ***Dehydration times vary based on humidity levels, cooking heat and type of dehydrator you are using. Reference your dehydration manual for additional information on cooking times. Once I hit the sixth hour I check the leather frequently. It is done when you can touch the leather without getting sticky fingers. It will shrink slightly and is still nice and pliable when you move the sheets. You can tell it is overcooked when it comes out brittle and is easily broken. Most of the time, I’m not able to get all my pieces exactly the same consistency during the leveling process, so for the last hour, I have to watch my dehydrator pretty closely to avoid overcooking. Once the fruit leather is done I pull out my raspberry fruit leather and let it sit for about 15-20 minutes. I want it nice and cool before I wrap everything up. I lay the dried fruit leather on saran wrap, cut and then roll each piece separately. Also, make sure and include a bit of extra wrap on each side so that you have a nice tight seal. I’ve been using this recipe for years and have had great success. I’ve used it with a mix of different berries including frozen fruit. I prefer fresh fruit, but they both taste great. I’ve personally love a mix of raspberries, blueberries, and applesauce. Trust me it tastes amazing. You can mix all types of fruits, the trick is just making sure the consistency is correct and remembering that the finished product will be slightly more tart than your uncooked product. PS. If you are interested in dehydration I highly recommend dehydrating apricots – talk about amazingly delicious!